Derek Yee takes a swipe at remaking his starring-role debut – Shaw Brothers’ 1977 wuxia flick Death Duel – with the help of Tsui Hark’s zany brand of blockbuster magic. 3D gimmickry and sweeping CGI vistas work alongside tangible, sumptuous sets and costumes, and the sort of fleshed-out, fully rounded characters you would expect to find in a contemporary remake. It takes a while for the film to settle into its romance narrative, and at times it feels like the film is in danger of becoming completely overwhelmed by its own imagination. But it soon hits its stride once the story wholly focuses on the two lovers at the heart of the story. 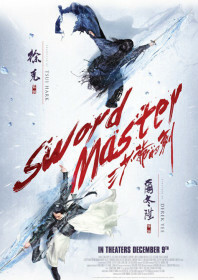 Like Death Duel, this references a Gu Long novel called The Third Masters Sword and places its characters in the distinctive world of the jianghu, or ‘martial world’. Following the breakdown of a proposed marriage between the heir to the Supreme Sword Manor school, Shao-feng (Lin Gengxin), and the head mistress of the Hsieh clan, Chiu-ti (Jiang Yiyan), the martial world is left leaderless and falls into disarray. Shao-feng favours a non-violent hermit’s life away from the strict social conditions and expectations of the jianghu. In contrast, Chiu-ti lusts for power and status, and their domestic struggle ends up being played out on a much larger, bloodier scale. The warring schools narrative is supported by a neat subplot based around the journey of Swordsman Yen (a scene stealing turn from Peter Ho). He’s a spectral figure and wandering assassin who believes his main rival, the Third Master, to be dead, and therefore his own life becomes something of an existential struggle. Battling with worsening health, Yen winds up literally digging his own grave in a poor, backwater village which becomes the epicenter of Shao-feng and Chiu-ti’s epic fallout. His sense of displacement helps to ground the film and stops it from becoming completely convoluted, as well as adding a lighter tone. Sword Master is available now on Blu-ray and DVD from Well Go USA.